Aaand it’s Monday again. I don’t know how this keeps happening! First it’s Friday night and I’m at a bar drinking whiskey sours and then wham! I’m waking up Monday morning to my alarm, all four of Fitz’s legs pressing into my back and the sound of his snoring filling up the room (also, dude totally needs a bath because he’s starting to smell like Doritos). I’m told that this sensation of time flying by only gets worse the older you get. I become less excited about being 25 every day. Somebody’s got a case of the Mondays! 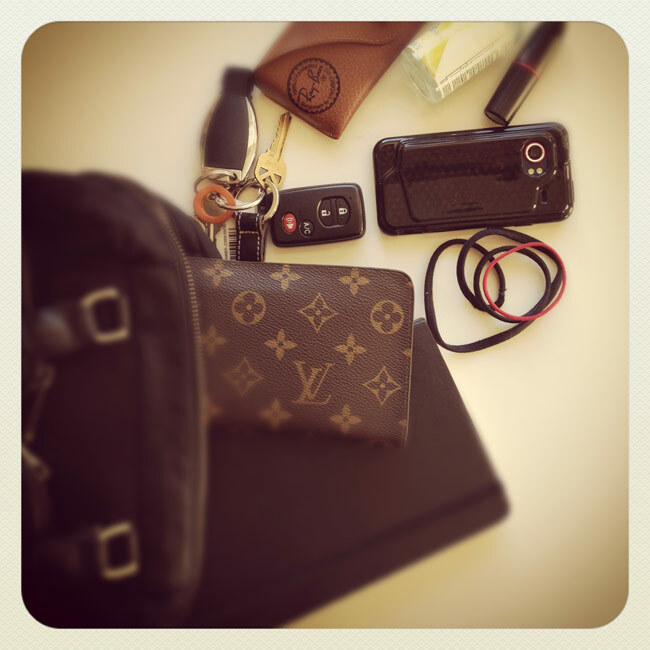 Love that wallet….and the tube of red lipstick! Kudos for including a grocery list! I swear by that Rosebud Salve for chapped lips in the winter, too. Those gloves are fierce! And I love that you carry an iPhone and an iPad. Go Apple! 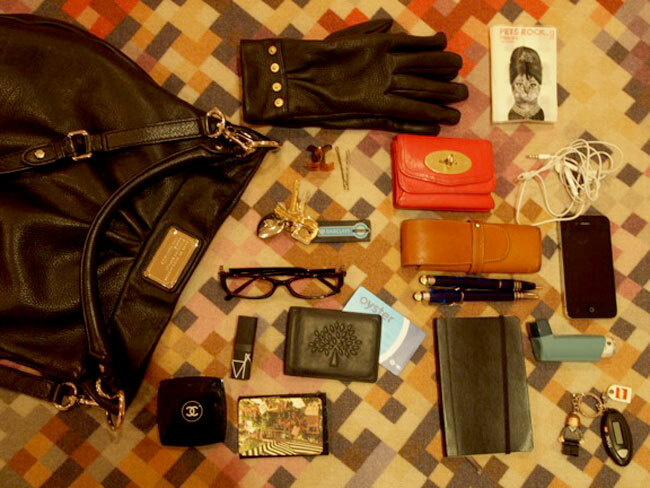 Think you know which bag belongs to which blogger extraordinaire? Ready to see if you’re right? Were you right? Guessing your own doesn’t count, you know! Haha. 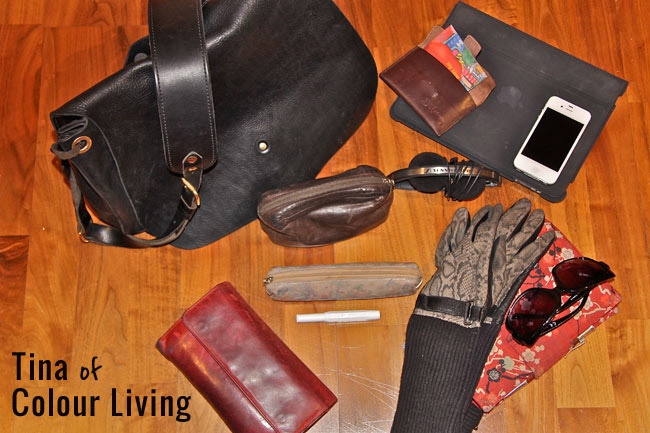 Were you surprised by any of the answers, or do you think the bag matches your perception of the owner? There weren’t any curveballs for me, I don’t think. But maybe I’m biased because I knew the answers from the get-go. That was fun! Thank you Theresa, Annie, Lauren, and Tina for playing along! Happy Monday everyone! I felt the same way about Theresa, too! I guessed Theresa’s was first one but could have easily been the other way round. Was trying to remember who wears what make-up. Knew about Nars lipstick but couldn’t place it. Lauren, great idea to take make-up out of bag. Anyway, Erin great follow-up, love the 2 parter. Was real fun and thank you for suggesting!! Really good interactive post. Ha! So you had an advantage going into this. If I had been an outsider, the Oyster card would have thrown me off, as it could have been yours or Annie’s or Chi’s! I wish the public transit system had a card system as effective as Oyster. I love the tube SO MUCH. Love this Erin! I knew Theresa lives in California so it couldn’t have been the ones with gloves. I love Lauren’s crafty items in her bag! This was SO much fun. I couldn’t place anyone. I’m terrible at this sort of game, but I have all sorts of other skills, I promise. I really, really loved looking at everyone’s bags. It’s like a tiny glimpse into each of your lives. And I have a new favorite item for my chapped lips. I’ve been thinking about heading back over to Theresa’s post about make up to sing its praises, but I haven’t had enough time. Stay tuned! Haha, no worries, I know you excel at making awesome table runners and taking beautiful photographs. You’re allowed to be not-so-good at guessing games! I’m happy you had fun with this! I thought I was hogging all the fun with this one. I want to know your secret chapped lips remedy! I’m always looking for new things because my lips get extremely chapped with little provocation. Fill me in, lady! I love this post. I guessed mine (of course!) and Annie’s because I know she carries the MJ hobo (and sings its praises). 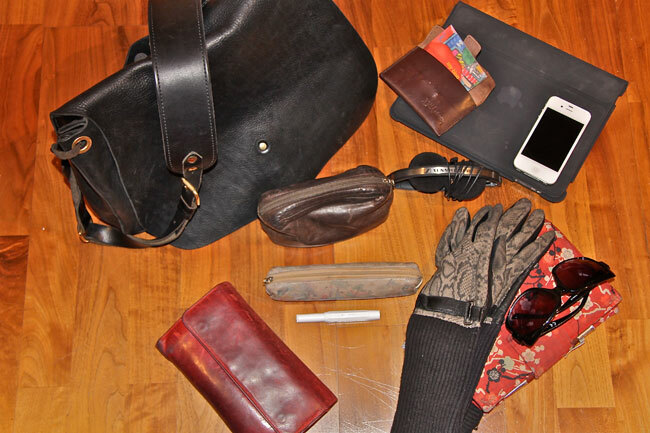 I do have a confession to make: I do have ugly stuff in my purse and I keep it all – receipts, little scraps of paper, lists, a picture of lily aldridge’s perfect hair – in an inside pocket of the purse. No sense in mucking up a perfectly pretty picture. Thanks for the Monday fun, Erin. I love the extra random stuff you carry around! Lily Aldridge’s hair? That’s awesome! I won’t lie, I like the cleaned up version you submitted, haha. I got them all right, hoorah! I want Theresa’s, it’s so neat and co-ordinated. Mine is tragic. I don’t like Harry Potter, I bought Hermione as she was the only female in a sea of Indiana Jones and Darth Vaders etc. It was a feminist act. Carmex is the bestest lip balm ever and I would die if they stopped making it. ‘Nuff said. But really I wanted you to comment on my Pet Rocks tissues, the cat has a beehive! Yours isn’t tragic! 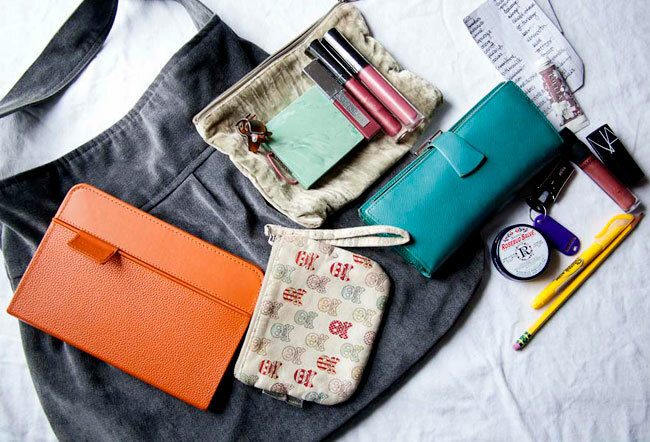 Everything is so stylish and organized. Are you sure you’re looking at the right bag? Haha. I’m impressed you got everyone’s right! I had the unfair advantage of knowing everyone’s beforehand, but they all kind of matched my previous idea of them, yours included. I didn’t even see the beehive cat! Shame on me.